Picking the right paint finish can have as much of an impact on the outcome of your project as picking the right color. When painting fireplace bricks, it's not that eggshell is better or worse than semi-gloss. Your choice will depend on the look you hope to achieve and the qualities you are looking for in your paint job. Painting a shoddy-looking fireplace is the least expensive, least labor-intensive way to update it. The finish of your fireplace should be taken into consideration. 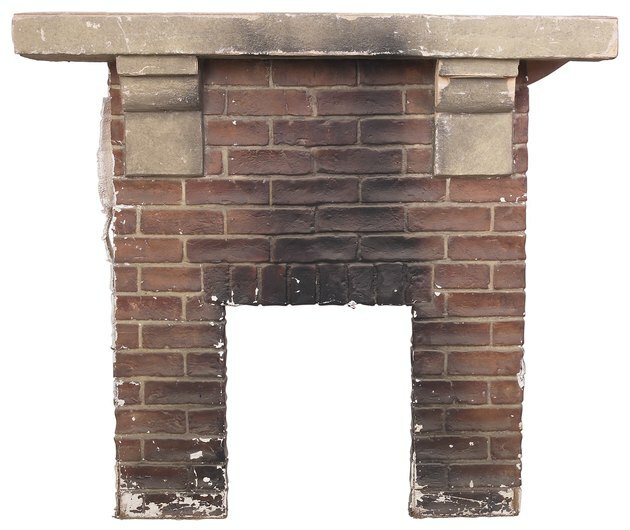 If your fireplace is old and has any cracks or problem areas, eggshell paint will make them less obvious. If you are looking for a flawless appearance but your fireplace is far from flawless, eggshell can hide a multitude of sins. Semi-gloss paint, on the other hand, will make all the imperfections in the bricks glaringly obvious at a glance. If you don't mind, then semi-gloss will not be a problem. The biggest difference between eggshell and semi-gloss paint is the surface sheen. Eggshell paint has a low-luster finish comparable to an eggshell, which is how it got its name. The finish gives a soft, warm glow when light hits it. It will give your bricks a more natural look. Semi-gloss is a high-luster finish. It is noticeably shiny, and any light in the room will bounce off it and create a glare spot. While it can look very polished and sleek, there is nothing subtle or natural about it. The bigger the surface you need to cover around your fireplace, the more glaring and distracting semi-gloss paint can be. If your fireplace is for fires and not just decoration, soot and dirt can ruin the paint finish no matter how careful you are. Semi-gloss paint is easier to clean than eggshell. With semi-gloss, you can wipe off dirt and smudges with an all-purpose cleaner and a rag, which is why it is a preferred finish for high-traffic areas. Eggshell is better than flat paint, but not by much. Stubborn stains may not come off, and sometimes you'll find water or detergent stains from your cleaning efforts left behind. If you are not a very skilled or experienced painter, you will find eggshell easier to use and more forgiving of imperfections in your painting technique. Semi-gloss can leave behind brush strokes that are boldly visible if you're not careful. Additionally, semi-gloss paint is harder to touch up than eggshell finish. A patched area on semi-gloss paint can leave a mark that is obviously newer, even if applied by a confident, experienced painter. Touching up paint with an eggshell finish is much less noticeable on the bricks. Mackenzie Wright has been freelancing since 2002 in the realms of writing, painting, photography, crafts and teaching the arts. Her writing has been featured in publications such as the "Saint Petersburg Times," "South Florida Parenting Magazine" and "Home Education Magazine." She holds a Bachelor of Arts in English and education.